Coping with paragraph numbering is a common cause of problems and irritation in Word. 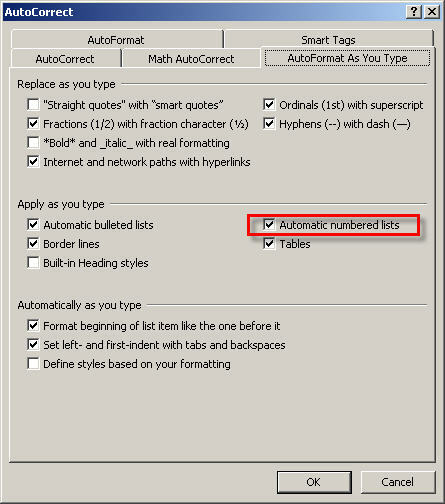 Whilst Word’s automatic numbering will cope adequately with simple lists, once things get more involved and multi-level numbering is required, things can quickly get out of hand. Our usual advice in these situations is to use Word’s ‘Outline numbering’ facility to cope with the numbers and formatting. A recent query from one of our clients who was setting up a ‘Letter of Engagement’ template, incorporating several levels of paragraph numbering, led us to investigate the whole area in a bit more depth – and to discover a useful – and vital – feature we were previously unaware of. So in this short series we will look at the whole subject of numbering in Word. First of all, let’s look at simple numbered lists and some possible complications. when we press ‘Return’ at the end, Word will (by default) automatically assume we are creating a numbered list, and turn on automatic numbering for us. There are two indent ‘pointers’ on the ruler. 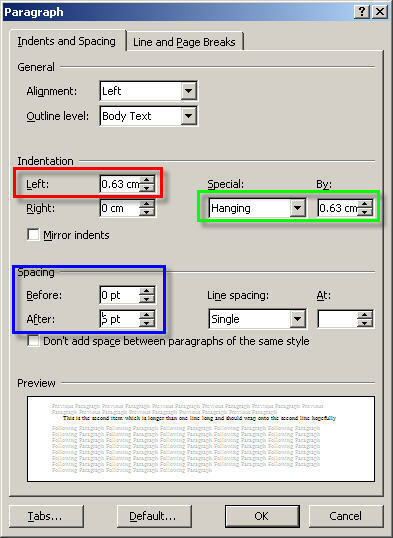 The top one controls the indent of the first line of the paragraph – as you can see in this example, it is set to indent the first line by 0.63cm. The lower pointer controls the indent of all the other lines in the paragraph – in this case it is set at about 1.26cm. Here you can see the combination of the ‘full’ left indent, and the ‘Special’ hanging indent. Simple as automatic numbering seems, there are some potential problems: firstly, how do we stop? This leads us on to issue two, spacing between the lines of our list, or including multiple paragraphs for one number. As we mentioned above, pressing return twice cancels the automatic numbering. This causes problems if we want additional space between each line of our list, and we want to add that space by including blank lines. Again, there are several ways around this. Perhaps the best is to set the paragraph spacing you require using the Format, Paragraph, Indents and Spacing screen described above. 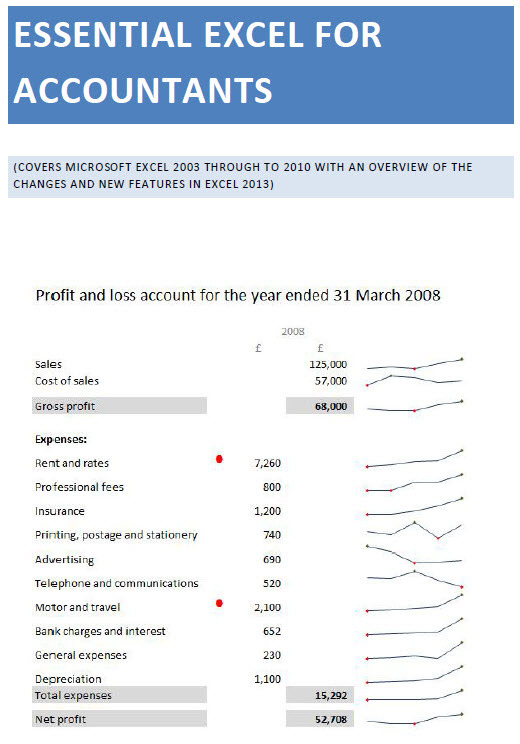 The ‘Spacing’ section of this screen allows you to set a Before and After spacing for each paragraph. In our example we are using a 6pt (about half a line) spacing ‘After’ each of our paragraphs. The keyboard shortcut ‘Control+0′ (zero) will toggle a 12pt ‘Before’ spacing on or off. In Word XP and later versions you can also use one of the ‘Smart Tag’ options to turn this option off. In the next part of the series we’ll start looking at multi-level numbered lists. This entry was posted in Office software, Simple, Word. Bookmark the permalink.